MCLEAN, Va.--(BUSINESS WIRE)--“Digital Key is fabulous!” "This is an extremely convenient benefit for being a Hilton HHonors member." “For a frequent traveler like myself, the ability to select my room and bypass the front desk is a competitive advantage. No other hotel group offers this type of service.” These are just a few of the 55,000-plus Hilton HHonors testimonials since Hilton (NYSE: HLT) launched Digital Key one year ago. Since that time, Digital Key has opened 2 million doors for Hilton HHonors members at 400 hotels. Two million doors opened for Hilton HHonors members – that’s nearly one for every home in the entire state of Arizona. Digital Key has gone global – it’s now available in Singapore, with plans for continued global expansion in 2017. Digital check-in with room selection is used over 1 million times per month. That’s once every two-and-a-half seconds. More than 70 percent of those who use digital check-in also opt to use Digital Key. Nearly 7 million rooms have been selected through the digital check-in feature since the beginning of 2016. Our top Digital Key user has unlocked 350 doors. That’s almost one door a day for an entire year! An app redesign this fall will bring Hilton HHonors to the iPad with full iOS compatibility and easier access to Digital Key including push notifications triggered at different moments of the guest’s travel journey to ensure a stress-free trip. By early 2017, multiple keys per room will allow family members and friends sharing a room to access Digital Key through multiple devices. In-app real-time chat will connect guests directly to front desk Team Members. Through the Hilton HHonors app, guests can request services such as housekeeping visits or a late check-out by simply sending a chat message as early as a day before check-in and up to a week after for any follow-up needs. 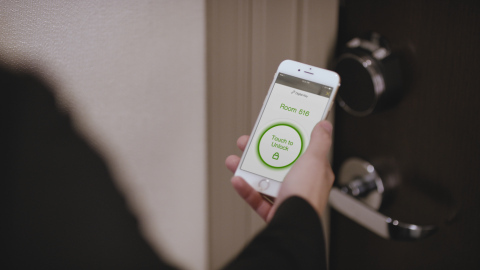 “Pin My Room” will invite guests to mark their favorite room in a hotel so they can select the same room on future visits. Digital Key, digital check-in, room selection and in-app real-time chat are exclusive benefits for Hilton HHonors members, available via the Hilton HHonors app, which is the highest rated hospitality app on the Apple App Store (4.8 stars) and is downloaded once every seven seconds. Hilton HHonors is free to enroll and offers members an exclusive discount every day at every hotel in the world, as well as access to unforgettable experiences on the Hilton HHonors auction platform. For more information and to join, visit the Hilton HHonors site here. Hilton (NYSE: HLT) is a leading global hospitality company, comprising more than 4,700 managed, franchised, owned and leased hotels and timeshare properties with over 775,000 rooms in 104 countries and territories. For 97 years, Hilton has been dedicated to continuing its tradition of providing exceptional guest experiences. The company's portfolio of 13 world-class global brands includes Hilton Hotels & Resorts, Waldorf Astoria Hotels & Resorts, Conrad Hotels & Resorts, Canopy by Hilton, Curio - A Collection by Hilton, DoubleTree by Hilton, Embassy Suites by Hilton, Hilton Garden Inn, Hampton by Hilton, Tru by Hilton, Homewood Suites by Hilton, Home2 Suites by Hilton and Hilton Grand Vacations. The company also manages an award-winning customer loyalty program, Hilton HHonors®. Hilton HHonors members who book directly through preferred Hilton channels have access to benefits including an exclusive member discount, free standard Wi-Fi, as well as digital amenities that are available exclusively through the industry-leading Hilton HHonors app, where Hilton HHonors members can check-in, choose their room, and access their room using a Digital Key. Visit news.hiltonworldwide.com for more information and connect with Hilton on Facebook, Twitter, YouTube, Flickr, LinkedIn and Instagram. Hilton HHonors is the award-winning guest-loyalty program for Hilton’s 13 distinct hotel brands, spanning more than 4,700 hotels, resorts and timeshare properties across 104 countries and territories. Hilton HHonors members who book directly through preferred Hilton channels have access to instant benefits, including an exclusive member discount that can’t be found anywhere else, free standard Wi-Fi and popular digital tools available exclusively through the industry-leading Hilton HHonors mobile app, where Hilton HHonors members can check-in, choose their room, and access their room using a Digital Key. With more than 55 million members, Hilton HHonors offers hundreds of ways to earn and redeem Points. Members can redeem their Points for free nights, premium merchandise, charitable contributions, or unique events through the Hilton HHonors auction platform (hiltonhhonors.com/auctions), such as exclusive artist experiences and hotel concert events with Live Nation® or a race experience with the McLaren-Honda Formula 1 team. Hilton HHonors members’ loyalty is also rewarded with more personalized service. There is no cost to join, and travelers may enroll online by visiting www.HiltonHHonors.com or connect with Hilton HHonors at news.hiltonhhonors.com.